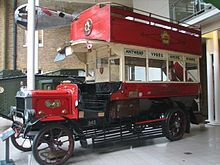 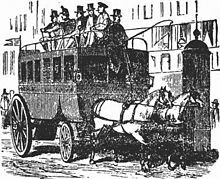 Daimler also produced one of the earliest motor-bus models in 1898, selling a double-decker bus to the Motor Traction Company which was first used on the streets of London on 23 April 1898. 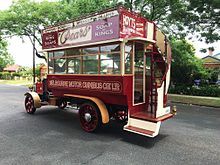 The vehicle had a maximum speed of 18 km/h (11.2��mph) and accommodated up to 20 passengers, in an enclosed area below and on an open-air platform above. 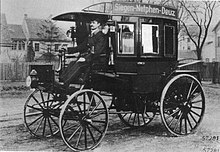 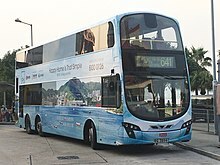 With the success and popularity of this bus, Daimler expanded production, selling more buses to companies in London and, in 1899, to Stockholm and Speyer. 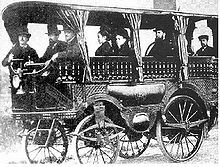 Daimler also entered into a partnership with the British company Milnes and developed a new double-decker in 1902 that became the market standard.